The dedication Sunday of the Russ Berrie Family Health & Recreation Complex at the Kaplen JCC on the Palisades in Tenafly marked a major milestone in JCC history. In January 2007, the JCC launched a Gift of Community Capital and Endowment Campaign to support renovations and program enhancements. 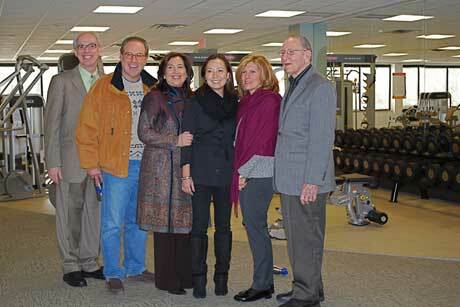 The Berrie Foundation gave the campaign a $2 million challenge grant, and the JCC has named its new fitness center in recognition of the Berrie family. The modern two-story facility features new exercise rooms, a spinning room, family changing suites with private facilities, new lockers, and an expansion of the JCC’s original fitness space to double its previous size, where members can take as many as 60 free group exercise classes each week. The complex also houses the newly renovated Seiden Wellness Center, featuring adult-only locker suites with a wide range of spa amenities, including private nutritional and fitness consultations, massage, facials, reflexology, stress reduction workshops, private Pilates sessions, sports-specific training, and more. The complex is the first completed part of the JCC renovations. Still to come are a new front entrance, atrium, and lobby; a centralized, totally renovated Rubin Early Childhood Wing, which will feature many new classrooms, a child-friendly teaching kitchen and a pre-school library; a new Youth Center, including a new teen lounge; and a host of other projects. “Our goal is to help people achieve healthier lifestyles and we are very pleased about our increased ability to meet the health and wellness needs of our community,” said Avi A. Lewinson, the JCC’s executive director.